About: WD (Wild Drawing) was born and raised on Bali, Indonesia, and has degrees in Fine Arts and in Applied Arts. He started off as street artist in 2000 and since then, he spends most of his time working in the streets, even though he never stopped working in his studio. In the beginning his work involved a full range of the so called street art, from paste ups and stencils to installations and freehand murals. During the past years he has focused on mural projects and as a support he combines roller technique with spray paint. His style consists of highly detailed photo realistic technique, influenced by comics and graphic novels. Social phenomena, life style, art or nature often inspire him. WD always tries to interact with the spot where he is working, by utilizing various elements that existing around, so to create harmony between the work and the place. Where you can see it: Currently he lives and works in Athens, Greece. He has carried out solo exhibitions, and participated in numerous group shows and festivals, in Indonesia, Greece, France, Germany, England, Italy, Malta, Switzerland, Denmark, Sweden. 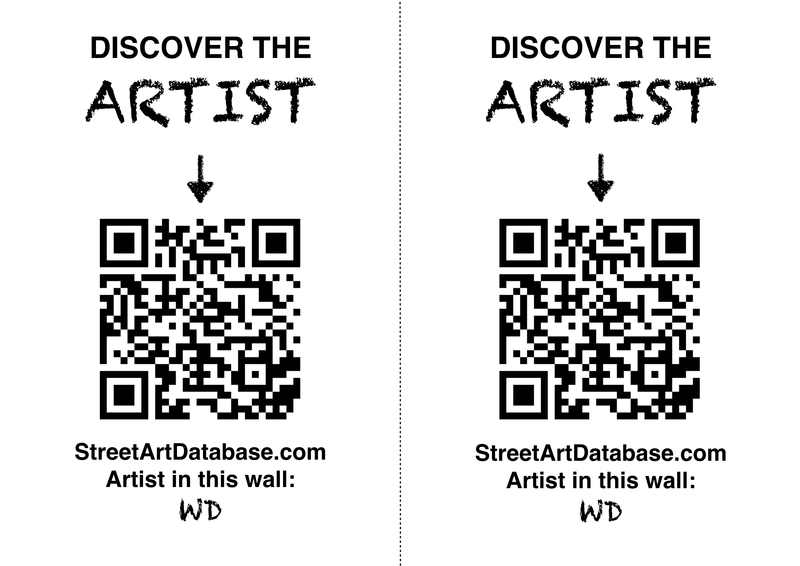 PRINT CODE: help tagging WD in the streets of your city!